Leukemias are thought to be sustained by quiescent leukemic stem cells (LSCs), which can transplant the disease and show unlimited self-renewal activity. As for HSCs, LSCs appear to be resistant to conventional chemotherapy. The mechanisms responsible for this resistance remain unclear, however their quiescent or even dormant status, as well as their localization within a protective bone marrow niche, are likely critical components contributing towards therapy resistance. In our group we are investigating whether resistant LSCs can be targeted by driving them out of dormancy or mobilizing them out of their niche. 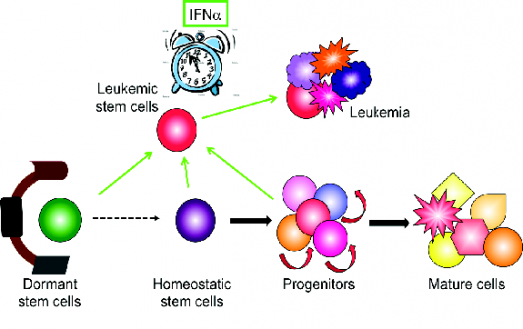 Our finding that IFNa can activate dormant HSCs, remodel their niche and may alter interactions of HSCs with their niche may open new possibilities to combine pro-inflammatory cytokines with conventional chemotherapy for the treatment of leukemia (Essers and Trumpp, Mol.Oncol., 2010; Trumpp, Essers and Wilson, Nat.Rev.Immunol., 2010). Our data also suggest that the order and scheduling of drug treatment will be critical for the success of this approach. Using mouse models for leukemia and by testing leukemic patient samples, we are currently exploring whether combination therapy strategies with pro-inflammatory cytokines followed by classical chemotherapy can be developed which will not only eliminate the bulk of the leukemia but also target the LSCs and thus potentially cure the disease.